EVER since moving to the campo I’ve been striving not to turn into a country bumpkin. It’s so easy to fall into the elastic waists and trainers scenario in rural Los Barrios (or ‘dress’ flip-flops if you’re going somewhere special). The trouble with elastic is, it expands with you and when the early spring sunshine encouraged me to shed my ‘jeggings’ like a butterfly emerging from a chrysalis, I found something a lot larger (a Mammoth moth, perhaps) staring back at me in the mirror. 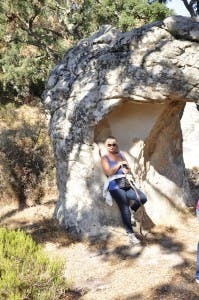 Then I saw an advert for a guided hike to the Caves of Bacinete to see Bronze Age graffiti, followed by a riverside picnic in splendid Los Alcornocales Natural Park. Length of hike: 5km; degree of difficulty: low; price: €10 (€3 for kids), including public liability insurance (which I need) – a decidedly more interesting way of k.o.-ing the kilos than 60 minutes on the cross-trainer. You have to drive your own motor to the starting point but with all the bumps and potholes, for once I felt quite proud of our hardy little Renault Kangoo which lead the convoy of posh(er), low-chasse cars. With the sun unseasonably hot, a brace of chilled aguas con gas in our backpacks and Iberia’s largest cork forest a glowing green canopy above our heads, we crossed a field of goats (pell mell and hells bells as they all scattered at once) and continued up … and up … for 30 lung-crunching minutes, following our athletic guide like unsure sheep to what might have been post-Paleolithic party central, 3,000 to 6,000 years ago, a place of celebration perhaps (or gruesome ritual, as there are tombs close by). galleries showcasing over 100 examples of Arte Sureña (Southern Rock Art). A little faded, a little abstract, one vandalised by some talentless modern cave artist but there’s one where you can clearly see parties of matchstick hunter-gatherers moving in for the kill on a variety of matchstick quadrupeds, some with horns. Who would have guessed Bronze Age man painted in the style of Lowrie! There were bees buzzing and butterflies fluttering (no sign of Mammoth moths) as we sat down in a sun-dappled grove to eat our picnics/lettuce leaf (for me) while a few brave souls plunged into the river (a bit too murky and glacial for my sensibilities). With good company and breathtaking scenery, it’s a way to get fit. Led by the affable Javier Collada of Mundo Posibilidades, his passion is sharing the ‘world of possibilities’ nature offers in this wild west corner of Spain. 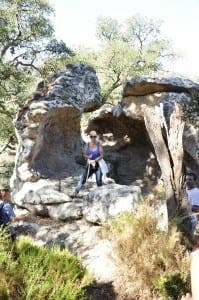 We should have driven on past the Venta El Frenazo, a famous halt for 21st-century hunter-gatherers and their hounds, plus bikers and hikers, equestrians, mushroom pickers and canoeists tottering along under upturned boats like injured beetles. Once a wayside inn on the Algeciras-to-Jerez road, the venta got bypassed by the motorway but it is back in business with types in fluorescent lycra and lemon-shaped hats who think they look the bees knees-and what knees some of them have. One of the park’s official mountain bike reception centres, you can get route maps, jamones, cheeses, home-made honey and a bunch of Instagramable pictures. You can also get gin and tonic which was my undoing. Next day, creaking from exertion and groaning from excess, I’d gained two kilos. It’s muscle tone, of course!